This was a sight quite common over a half century ago, but it is hard to find someone who now remembers it. 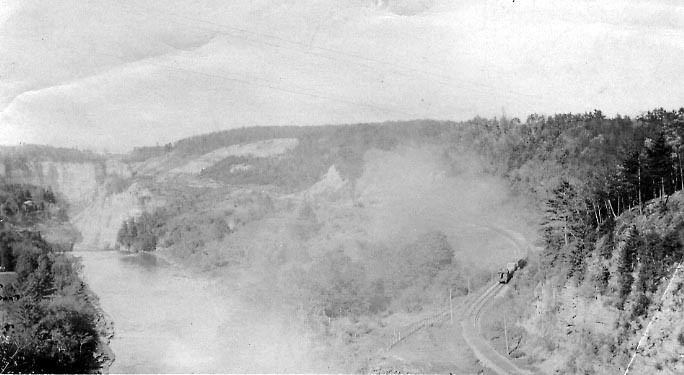 It shows a train heading north on the Pennsylvania Railroad. Taken from the Portage Railroad Bridge, the image captures a train which has just passed under the bridge and is now heading along the old path of the Genesee Valley Canal toward the slide area. You can get a glimpse of the Glen Iris among the trees to the left, beyond the Middle Falls. The line belonged to the Genesee Valley Canal Railroad after the Canal closed, which later became the "Pennsy". The Pennsylvania Railroad closed about 1960 and the tracks were removed. The Park's Trail 7 and the Genesee Valley Greenway now follow much of the route. The date for this photograph is estimated, it is difficult to determine the exact year from the photograph. The image is labeled on the back in script "Pennsylvania R.R. tracks, formally Canal to Rochester on right Bank facing North, Middle Falls in Middle of picture - taken from bridge."